No Comments, Holiday Cottages in England, Holiday Cottages in the UK, by cottagewriter. A self-catering holiday cottage in Cornwall with the family or a group of friends is the perfect way to have some serious fun and totally recharge, whatever the time of year. There are outdoor activities for everyone plus a whole range of visitor attractions including the famous Eden Project, a global garden for the 21st Century. The Cornish towns of Falmouth, St Ives, Newquay, and Padstow are great places to rent a self-catering cottage, and all have much to offer in terms of art and culture, heritage and history along with great pubs and fine restaurants. View our selection of Which Cottage Approved of Self Catering Cottages in Cornwall ranging from cosy listed buildings for couples to modern family homes. Cornwall is a county bathed in history, with a solid culture built up by thousands of years of heritage. Strong light and maritime views have made it one of the most sought-after locations for visual art, and it has an equally strong folk music tradition. Visitors to the region are met with a relaxed way of life, a pleasant climate, and a range of breathtaking scenery including rugged coastline and sandy beaches. Choose one of our holiday cottages in Cornwall when you visit, to get the most from your holiday or weekend break. When planning a holiday some of us have a very important consideration, our Pets. They are such an important part of our lives and we like to take our furry friends on holiday with us! And anyone who is owned by a dog knows what our doggies like best! Walkies! 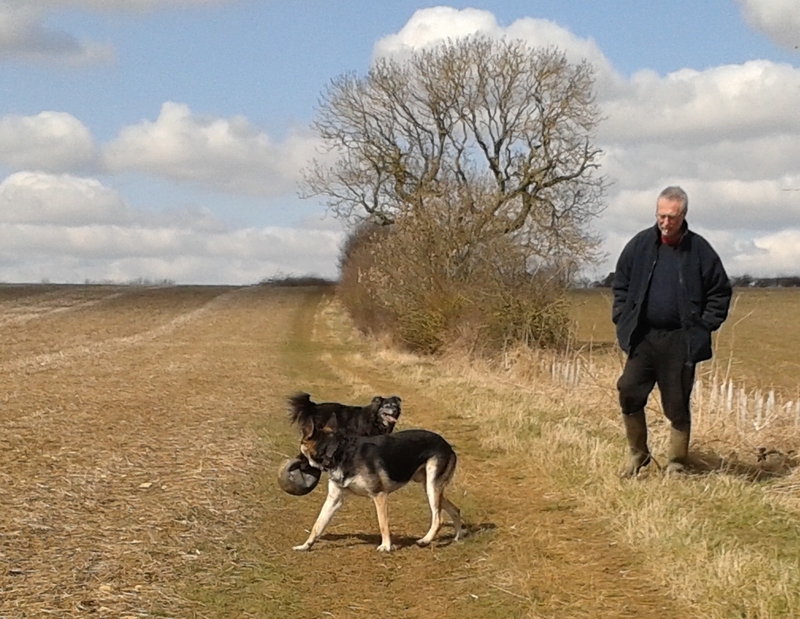 Especially if these walks are in open countryside where they can just run to their heart’s content. That’s why a cottage holiday in Yorkshire is one your pet would definitely thank you for. With miles of stunning coastline, beautiful countryside and national parks this is a fantastic region of England to experience the great outdoors! As you start planning a holiday with you dog have a look at these Which Cottage Approved Holiday Properties in Yorkshire region which welcome pets. Broadgate Farm Cottages are just 2 miles from the delightful market town of Beverley, on the edge of the Yorkshire Wolds. The perfect location from which to explore East Yorkshire countryside. Amongst the highlights of the area The Spurn Point Nature reserve is a beautiful place for bird watching, sea fishing, walking or exploring the shoreline with the family. The towering chalk cliffs of Bempton are home to thousands of sea birds including Puffins and Gannets. 5 self-catering properties, 5 star rated, Sleeps: 2 to 8 per cottage (26 in total). Beverley. Red House Farm Holiday Cottages is a wonderful collection of superbly presented brick cottages situated in a quiet rural location 6 miles from Beverley, East Yorkshire. These pet-friendly cottages in this tranquil corner of Yorkshire are ideal for exploring York, the East Yorkshire Coast, or for a cycling and walking break for a group. This lovely historic cottage offering self-catering accommodation that sleeps 4 is perfect for exploring the beautiful city of York and rural North Yorkshire. A lovely family cottage that provides everything you need for a relaxing and comfortable stay in this beautiful part of Yorkshire. There is a private enclosed garden for relaxing in and the cottage faces onto Knavesmire, a large green area where York horse Races are held. Bedrooms: 2 (1 double, 1 twin). Sleeps 4. Dringhouses, York. Short breaks off-peak. Pets welcome. Fife is full of history and as it has the sea on three sides has a huge amount of superb coastline and beaches . If you are planning a vacation in Scotland then there is a wide choice of superb self-catering accommodation in Fife. The East Neuk of Fife is made up of a series of fishing villages and towns built up around their harbours. St Monans is one such quaint village which houses many historical sites such as the remnants of the 18th century Salt Pans, the Windmill, and the ruins of the 17th Century Newark Castle not forgetting the 14th Century ‘Auld Kirk’. 8 East Shore is a cosy traditional fisherman’s cottage on the harbour in this beautiful village. This lovely Fife property faces the sea and is a sandstone building spread over 3 floors. There is a large well equipped kitchen/dining area, tastefully furnished double and single bedrooms and a comfortable sitting room on the 3rd floor at the top in typical East Neuk style. The sitting room has a wood burning stove, 2 comfy sofas and 2 windows making the most of the views across the Forth Estuary to North Berwick and Edinburgh. Just over an hour drive from Edinburgh and 20 minutes from St Andrews this lovely cottage is rented out year round. There is a lot to see and do in St Monans and 8 East Shore makes a perfect base for families or group of friends to explore the area. Short breaks and pets welcome too! Hidden within an ancient Highland estate in Glenisla in the Cairngorm National Park are three charming properties which make the perfect base for a holiday exploring the wonderful mountains and moors of Perthshire. Wester Brewlands, Brewlands Cottage & Claypotts self-catering holiday homes are idyllic, luxurious houses in the heart of spectacular Perthshire countryside on the bank of the lovely river Isla. All three properties are only 1 1/2 hours from Edinburgh, in close proximity of golf courses, shops, pubs and an adventure centre. Whether you prefer a relaxed holiday, or an active one, the options are many and varied. This luxurious 5-star Scottish Tourist Board rated idyllic 18th century cottage has a tranquil setting on the bank of the beautiful river Isla at the heart of a large Highland Estate in the Cairngorm National Park, yet it is only 1½ hours from Edinburgh. We can organise a cook, hot tub, fishing on our lochs and river, babysitting, massage, golf, shopping, watersports, riding: anything to make your holiday a happy one. Bedrooms: 3 – 1 Kingsize, 2 twin. Bathrooms: 3, 1 ensuite. Sleeps 2-6. Non smoking. Short breaks and pets welcome. 30 minutes from Pitlochry. Luxury 17-century cottage set on a Highland Perthshire estate amidst spectacular countryside on the bank of the lovely river Isla, yet only 1½ hours from Edinburgh. 5-star STB accommodation with wonderful extras on offer, including a chef to cook gourmet meals, lochs, fishing and cycling on the estate, a games room and the use of a hot tub! A perfect base for exploring Scotland. Bedrooms: 3 – 1 kingsize ensuite, 2 twin. Bathrooms 2. Sleeps 2-6. Non smoking. North of Blairgowrie. Short breaks and pets welcome. A superb, luxury 5 star historic house, sleeping 14 in great comfort, in an utterly tranquil setting at the heart of an ancient Highland estate in the Cairngorm National Park with 120 acres of beautiful formal gardens and grounds including a highland burn and 2 lochs, yet only 1½ hours from Edinburgh. It is surrounded by some of the finest scenery in Scotland. The house combines privacy with the amenities of a top hotel: tennis court, games room, hot tub and many other facilities available including watersports, games room, golf, riding, shooting and mountain bikes and a chef. Bedrooms 8 – 3 double, 4 twins, 1 single. Bathrooms 6 – 5 ensuite. Sleeps 14. Self-catered, partially or fully catered. Short breaks welcome. No pets. No Smoking. Stately homes and historic houses in Scotland provide a perfect setting for special events like birthdays and other celebrations. There is a great selection of holiday houses all over Scotland from Castles to Victorian lodges with excellent facilities for children and adults, perfect if you want to holiday with your family or a group of friends. Renting a large self-catering cottage is a great way to have an economical holiday, the cost of a big holiday cottage shared between friends or families works out very reasonably. As you can see from the Which Cottage approved sample list below there are large holiday homes and cottages in all areas of Scotland to suit varied budgets, tastes and requirements! Windy-Yett Farm, a beautiful period farmhouse, provides a perfect rural retreat for exploring central Scotland, the Trossachs and beyond. It is set in 9 acres of rolling landscape with its own private lochan and abundant wildlife. Within 10 mins are Linlithgow Palace and the Falkirk Wheel. Windy-Yett Farm is a fabulous location to get together with family or friends and have a wonderful self catering holiday in central Scotland. Bedrooms: 4 – 2 double, 1 triple, 1 bunk. Sleeps: 9 + 2 (sofa bed). Falkirk / Linlithgow. Well behaved pets welcome. Short breaks available. The Old Manse of Monzie is a very spacious house set in the glorious Perthshire countryside. Nearby are famous golf courses, distilleries, castles and fabulous walking from the doorstep so you might not have time to drive the hour to Edinbugh to explore its delights! Indeed many guests don’t stray far and just enjoy relaxing in front of the open fire, watching the red squirrels and admiring the view! Bedrooms: 5 (3 double, 2 twin). Sleeps: 10. Crieff. Short breaks available. Pets welcome. Methven House is very well positioned in the popular holiday destination of Elie 130 yards from the gently shelving blue flag beach and golf course. There are lovely coffee shops, cosy pubs and fine dining. Most watersports are covered in the summer, with tuition available in sailing, windsurfing and waterskiing. Easy cycling and lovely walks available from the house and up and down the coast of the East Neuk. This area of Fife seems to have a micro-climate of its own and is one of the driest locations in Scotland! Logie Country House dates back to 1492. This historic house has extensive grounds, turrets, an enclosed courtyard and indoor pool. Guests can explore miles of estate tracks for walking and cycling. There is fishing available in the river Urie from the front lawn or estate’s private island. Bedrooms: 5 – 2 double en-suite, 2 double, 1 twin. Sleeps: 10. Pets welcome. Equestrian facilities. Short breaks. Green Craig is a luxuriously appointed exclusive residence situated directly on the beach yet only 35 minutes drive from central Edinburgh. The house is beautifully situated in 50 acres of private woodland estate, on the shores of the Firth of Forth. East Lothian is considered a golfer’s paradise and this house has one at the bottom of the garden! Enjoy a variety of wonderful local outdoor activities from hill walking, sand yachting, horse riding, game shooting, fishing, and marvellous local beaches. The house is perfect for golfing parties, family get-togethers, romantic holidays or small corporate events. Bedrooms 6 (flexible – super kings, doubles or twins). Sleeps: 12. Aberlady. Short breaks. Pets welcome. Larach Sithe (Pronounced Lara Shia) means “tranquil place” in Gaelic and this describes the setting and atmosphere of this idyllic location perfectly. Larach Sithe is an ideal choice for groups or large families who are looking for an active outdoor holiday in a beautiful part of Scotland. It is set on a quiet croft situated well away from the main road at Scallasaig two miles from the tranquil and friendly village of Glenelg. Spectacular views from the house reflect its open aspect. Bedrooms: 5 – 3 double, 2 family (double/twin + bunks). Sleeps: 14. Glenelg 2 miles, Kyle of Lochalsh 20 miles. This extremely comfortable holiday house has stunning views of Glen Feshie from the conservatory dining room. March House is a wildlife and sporting enthusiasts paradise situated in the Cairngorm National Park with many local attractions. Suppers using local ingredients can be prepared by an accomplished ‘Taste of Scotland’ cook of 15 years. March House offers high quality accommodation in a stunning setting and the opportunity to get together with family or friends for an unforgettable Scottish self-catering holiday. Bedrooms: 6 (2 kings, 3 twins/super kings and 1 family with king plus bunks). Sleeps: up to 14 (12 + 2). Aviemore / Kingussie. Pets welcome. Short breaks available. Lochinvar Lodge and Lochinvar Cottage are situated in an idyllic setting overlooking a private loch. Both buildings have magnificent views and there is an abundance of wildlife right on the doorstep. Free fly fishing is available on the loch and it can be also be used for non motorised water sports. A range of activities including water skiing, kayaking, sailing, windsurfing, climbing, archery, quad biking and even outdoor laser quest can be enjoyed. Lochinvar is an ideal location for cyclists as well as fishing enthusiasts, walkers and families. Bedrooms: 5 – 1 king-sized 1 double, 2 twins, 1 family room (bunks + 1 single + pull out bed), 1 fold down bed. Sleeps: 13. Castle Douglas. Pets by arrangement. Short breaks – off peak only. Catacol is a family home, built with family in mind. Spend the day walking up the glen, or cast your rod in the sea. Bring your catch home and cook it on the barbecue and eat, all together in the warm family kitchen. Heaven! Or, take the ferry to Clonaig and visit Skipness Castle. Catacol has adventure on the doorstep…. Bedrooms: 6 (4 twin, 1 super king double, 1 family room with 4 singles). Sleeps: 12-14. Brodick. Short breaks low season. Pets welcome. 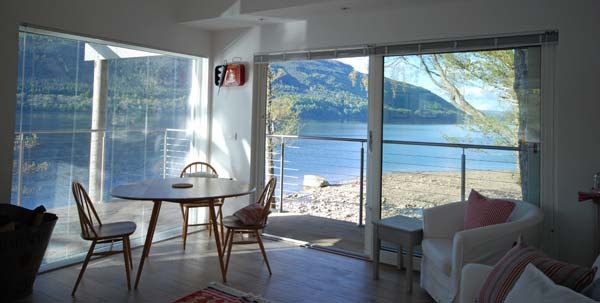 This is a luxury self-catering house in Ardnamurchan in the West Highlands of Scotland. The area is perfect for walking, cycling, fishing and kayaking and is a wildlife enthusiasts’ paradise. For large holiday groups there is an adjoining 2 bed cottage to rent so the accommodation can sleep 12 + children (maximum 16). Bedrooms: 6 en-suite bedrooms sleeping 12 – 16. Fort William 25 miles. Giant hot tub. Wheelchair accessible (Cat 1). Pets welcome. A selection of Which Cottage approved Holiday Homes and Cottages in England with disabled access and facilities. We do recommend discussing individual requirements with the cottage owner prior to making a reservation for peace of mind that your needs can be adequately catered for. Alice Cottage is a 5 star rural cottage situated in rural Northamptonshire, close to town of Oundle and convenient for walking in the lovely wooded Nene Valley, exploring manor houses and gardens, pictureesque market towns and country pubs. The ancient woodland above the Nene Valley is a mosaic of habitats and the area teems with rare wildlife. It is a great area to take children on holiday, with cycling and watersports around the region’s many lakes. The accommodation is fully accessible for wheelchair users. Sleeps: 2. Bedrooms: 1 (1 double). Oundle. Short breaks off-peak. Disabled access. Sorry, no pets. Thornbridge Manor is a luxury holiday property ideal for families and larger groups as the accommodation is very flexible. This stunning property has been fitted out to the highest standard and provides you with an ideal base from which to explore all that the Peak District has to offer. It has so much to offer including a tennis court, croquet lawn and children’s play area. Not sure how you will find the time to get to Chatsworth House or Alton Towers or the other local attractions but you just might! 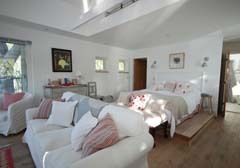 Jonty’s cottage is a traditional Lake District property but with a contemporary modern interior. Situated in the village of Elterwater, the cottage gives you the chance to relax in comfort and enjoy the stunning surrounding area of the Lake District hills. You can hill walk, rock climb or scramble in the Great Langdales or just stroll down to the local village Inn. Located in the heart of the Lake District, the property is an ideal base from which to explore the English Lakes. 1 Double and 1 Twin. Ambleside and the Langdale Fells. Off-road parking. Disabled access. Wisteria Cottages are nestled in the beautiful Shropshire countryside. Each cottage has own outside space, including a patio with table and chairs, from which you can relax and enjoy outstanding views of the south Shropshire hills. These cottages are ideally located in a central Shropshire location providing an excellent base for cycling, walking, golfing and horse-riding breaks. The cottages are modern, fully equipped and furnished to the highest standards. You can unwind in comfort after a long day exploring the wonderful Shropshire countryside. Bedrooms: Cottage 1: 1 twin room; Cottage 2: 1 Double Bed. Shrewsbury. Short breaks (3 nights minimum). Disabled access. Acorn Park is an impressive modern country house that is set in its own grounds in a very quiet small valley, surrounded by stunning countryside, yet just 5 minutes drive from the Exeter junction of the M5. Equally it is just 5 minutes from Exeter airport so perfect for those looking for an easily accessible holiday let in Devon. The property has its own indoor heated swimming pool and the accommodation is ideally suited for families or groups of friends trying to get together for a break. Acorn Park is located near to the Jurassic Coast which has been allocated as an area of Outstanding Natural Beauty. Beacon Hill Cottage is one of 15 self catering holiday cottages on a beautiful farm, situated deep in unspoilt countryside between the Cheviot Hills and the magnificent Northumberland Heritage Coast. The holiday homes are within a short walk of a superb spa and a wide range of leisure facilities are included in the rental – use of the swimming pool, jacuzzi, fully-equipped gymnasium, sauna, steam room, and tennis court. This fabulous 5 star cottage in this glorious corner of England is within easy reach of some of the country’s best, uncrowded beaches, rare and lovely wildlife, castles and stunning landscape, ideal for walking, cycling or swimming. For a lively family break or a special spa treat in heavenly rural surroundings, these lovely Northumberland cottages have got it all. Sleeps: 6. Bedrooms: 3 (1 double, 2 twin). Morpeth 5 miles. Short breaks off-peak. Sorry, no pets. Disabled access. Gym and Spa facilities. Situated near Honiton and Axminster, Longbridge House is an ideal property for a family holiday or get together with friends. Equally, it’s a great place to consider for either a stag or hen weekend as there is so much to do at Longbridge House that you may not want to venture far from this stunning property! There is an indoor heated pool, games room and fishing available in the grounds so there is something for everyone. The location of Longbridge House is ideal as it’s near the Jurassic Coast which is a designated area of Outstanding Natural Beauty. 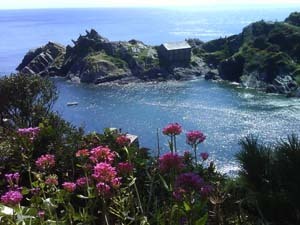 This is an ideal base from which to explore all that Devon and the beautiful beaches of the South West has to offer. 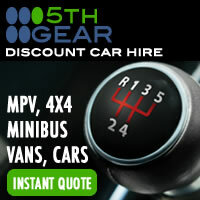 It is easily accessible from the M5, M4 and A303. Holiday cottages with disabled access in England | Which Cottage. Want some sun, sea and sand? Rent seaside holiday cottages throughout the UK and enjoy the foreign holiday experience without straying too far from home. With beautiful properties located in the UK’s most well known coastal resorts, such as Cornwall, you’re sure to find the perfect beach holiday experience for you and your family. So grab your bucket and spade and prepare to soak up some serious rays at far more attractive prices than if you were booking into a hotel. 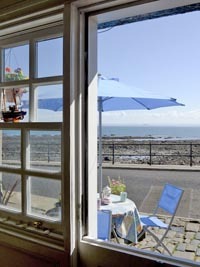 Late availability seaside holiday cottages via Last minute seaside cottages. There are many lovely cottages in the pretty towns and villages that make up Speyside. The north east of Scotland includes charming towns of Banff, MacDuff and Elgin. Burghead (near Lossiemouth) is popular with Hogmanay visitors as it re-enacts the ancient New Year ceremony of ‘Burning the Clavie’. The River Spey starts above Loch Laggan and finally enters the sea near Buckie – the Spey is famous for its astonishing natural beauty and great fishing. Speyside is an idyllic location for a self-catering holiday cottage where you have the freedom to explore the heather hills and snow-capped mountains. 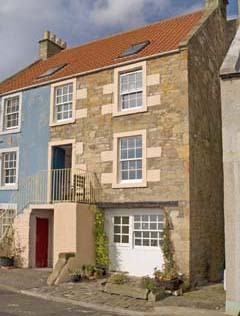 Several Which Cottage Approved holiday homes are listed on scotland-holiday-cottage.com offering holiday accommodation to suit couples, small families and large groups alike. Some properties welcome pets and several holiday home owners will offer short breaks subject to availability. 2 Comments, Holiday Cottage News, Holiday Cottages in Scotland, Holiday Cottages in the UK, by cottagewriter. A perfect escape for Honeymooners after the hustle and bustle of that big family wedding! Planning a romantic getaway or anniversary surprise? 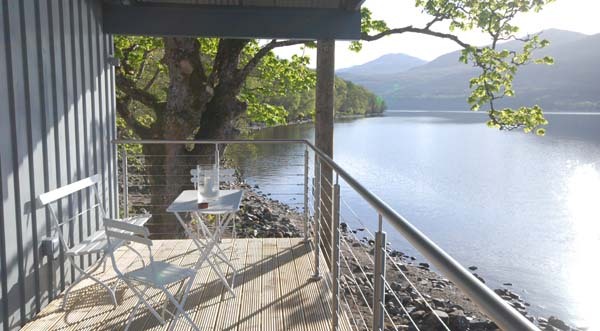 Perched on the water’s edge, Dipper is a secluded holiday home just for two with stunning views over Loch Tay. With Ben Lawers and over fifty gloriously secluded acres of private woodland, wild meadow and loch shore for company, this is a rare place to dream, to be in love, to leave the rest of your life behind for a few days. 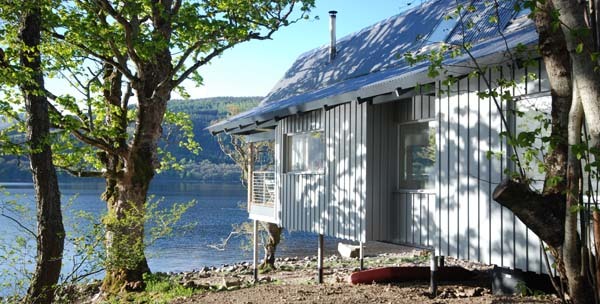 Dipper is a contemporary take on the classic loch-side boathouse with a sustainable wooden structure with a corrugated aluminium roof designed by award-winning architect Colin Smith. Big picture windows look out across the loch in all directions for you to stay in bed and soak up amazing views, or snuggle up on the comfy sofa and relax as you enjoy this magical place of magical place full of light, changing weather, ancient trees, nature and solitude. The accommodation consists of on open living space with the king-size bed on raised platform at back of living room. This cosy holiday home is very beautiful and built to the highest standards with solid oak planked floors; a contemporary Danish log burning stove; Neff kitchen appliances ; Duravit and Hansgroh bathroom fittings; and original limited edition prints and signed photographs on the walls. Dipper is just two hours’ driving from Glasgow airport, fractionally less from Edinburgh. There are railway stations at Pitlochry and Dunkeld, on the main Inverness line, both within about 45 minutes’ driving. The city of Perth is one hour’s drive to the south, Inverness two hours to the north. Aberfeldy is 7 miles & the Local village shop is only 2.5 miles away in Kenmore. 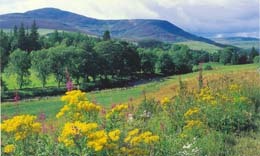 Highland Perthshire is a wonderful place to visit. With lochs, forests, mountains, castles, history and whisky, walking, fishing and golf this is a region rich in ancient history, natural heritage and folklore. Uninterrupted views of the loch and snowy mountains beyond. Situated on Inchyra, a private estate near Perth, Stable Cottage has been fully redecorated recently and is a very stylish and comfortable holiday cottage. Inchyra was once described by Country Life as ‘the most perfect small estate in Scotland’. The charming Stable Cottage is the former groom’s cottage for the estate and nestles in the corner of the old stable yard of Inchyra House, a Grade A listed Georgian house in the beautiful Carse of Gowrie in Perthshire. The house was built in 1795 and was designed by the renowned Scottish architect James Gillespie Graham. Inchyra House and its outbuildings sit at the end of a long drive in 120 acres of stunning parkland. 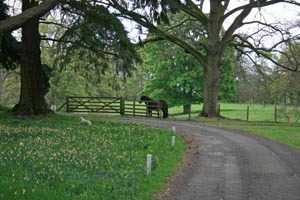 You will find yourself surrounded by fields of horses, cows and sheep and with free range chickens pecking about. The Inchyra estate has the big advantage of being very close to great transport and towns while being tucked away in its own little world. 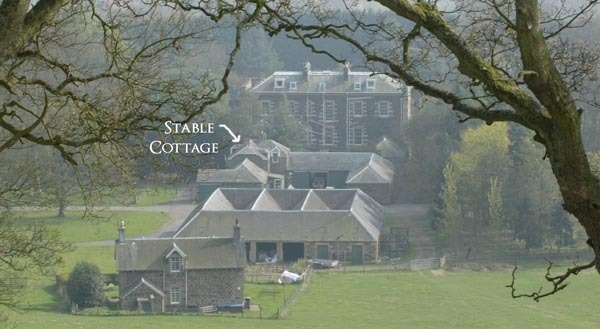 Stable Cottage provides a wonderful base from where you can enjoy fishing, shooting, hunting, climbing,riding. You can walk, fly, kayak, white water raft, mountain bike, sail and more too! And, of course, one of the main reasons many people come to this area of Scotland is for the golf. There are forty courses in Perthshire alone and several championship courses within easy reach with Gleneagles, Carnoustie and St Andrews nearby. Stable Cottage has a well equipped kitchen and a cosy sitting room with sofa and chairs, a big log fire and drinks cupboard, this is a room to curl up in after a long day out and catch up on a bit of television or chat round the fire. The interior of the cottage has been beautifully decorated throughout in the owner’s own Inchyra linens, produced here in Scotland. Book this very stylish and comfortable self catering property near Perth. Limited weeks available for the Summer! Cottage Facilities: Bedrooms: 3 (1 double, 2 twin). Sleeps: 6. Perth. Pets by arrangement. Short breaks possible. Accessibility: Perth Staition – 5 miles, Airports – Dundee 15 mins, Edinburgh 45 mins.